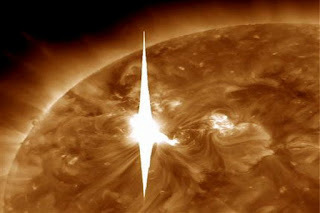 One of the strongest solar storms in years engulfed Earth early on Thursday, but scientists say the planet may have lucked out. Hours after the storm arrived, officials said were no reports of problems with power grids, GPS, satellites or other technologies that are often disrupted by solar storms. But that still can change as the storm shakes the planet's magnetic field in ways that could disrupt technology but also spread colorful Northern Lights. Early indications show that it is about 10 times stronger than the normal solar wind that hits Earth. One of the strongest solar storms in years engulfed Earth early on Thursday, but scientists say the planet may have lucked out.